This is a calendar that shows when you can stargaze. Each stripe on the chart shows a 24-hour period, with midnight in the middle. Where the stripe is light blue, the sun is up. Three levels of twilight are shown in darker blue, and the thin, yellow stripe shows when the moon is up. First, use the "Location & Time Zone" tab to set up the chart. Now, hover over any location to see the time, date, and moon phase at that point. The program starts with today's date in the center, but you can select a different date above the chart. In the planets tab, you can see the rise and set times of any number of planets at a time. The stripes on the chart are lighter when the planet is below 10°, because viewing a planet at that low an altitude is rarely satisfying. UT is Universal Time (which is pretty much the same as Greenwich Mean Time). 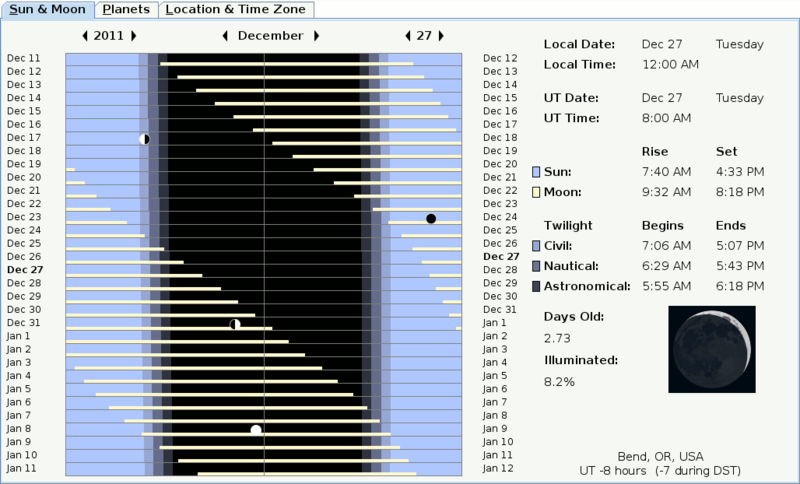 Astronomical events are usually reported in UT, so it is shown on the chart. Twilight has three defined levels, which are named by what you can do during each one. Civil twilight starts at sunset, and at the end, it is too dark for most outdoor activities. At the end of nautical twilight, you can no longer see the ocean against the sky. At the beginning of astronomical twilight, astronomers usually start using their telescopes. (Not always though—some planets are visible even during civil twilight.) At the end of astronomical twilight it is fully dark, and astronomers are happy! The same levels of twilight are seen in reverse in the morning. Change the location to the South Pole, and step through the months. See what that does to the sky! The other extreme is Quito, Ecuador, right on the equator. In Kashgar, China, you can see what can happen if your country ignores time zones. Look at when the sun sets in June! Use the custom daylight saving time schedule to see what would happen if you set the clocks two hours ahead or behind. This has been proposed before by politicians in the U.S. and Great Britain. The program is written in Java. The low version number reflects the fact that I have lots of plans for improvements. The next thing I plan to add is a window with Jupiter's moons, but it might be a while—this is only a hobby. I also plan to make a version you can download, so you can run it without coming to this site. I created pretty much everything you see here, but I had to look up the formulas for finding the positions of objects. Orbital math is tricky! It took me a couple months to write, but they were spread out over more than a year because I'm often too busy. For those who know what it means, it about 6,000 lines of code. This program runs in Java, so you need the Java browser plug-in to see it. You may have the plug-in installed but have it deactivated in your browser, so check the preferences. If you really don't have it, follow the link above to download it. It's free. In the mean time, here is a picture of what you are missing. If it used to work, but it doesn't now, that probably means I updated it, and there is a conflict between the two versions. Restarting the browser seems to clear this up.